I can hear the whispers and I can see the laugher. The way you look at me when you pass, then look into the stroller I am pushing and you see furry animals instead of a human baby. I feel embarrassed and the look on your face makes me feel like I should be ashamed. 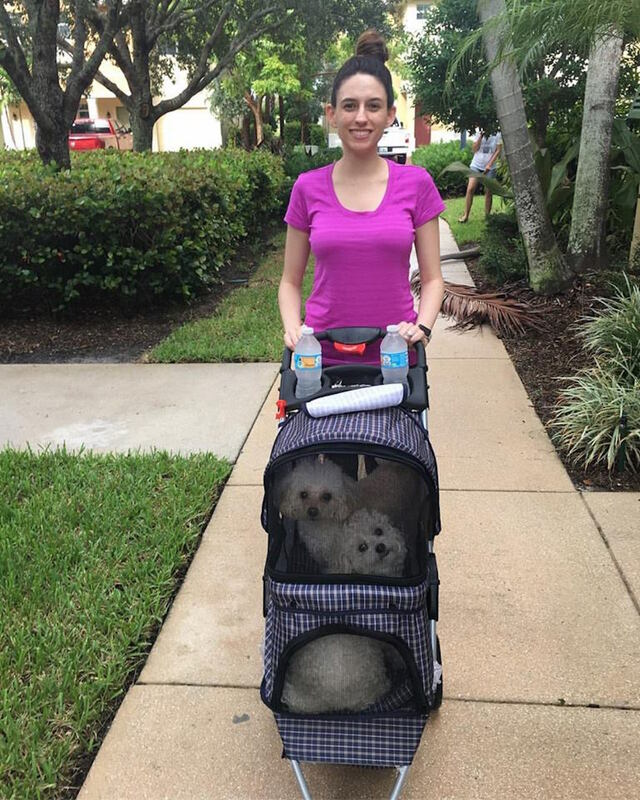 When I posted a picture of me smiling with my two poodles on Facebook, I received a comment saying, “When are you going to have real kids?” If you really must know, the answer is quite long. Plus, you are judging me because you had kids and you think it’s ridiculous that I am pushing my dogs in a stroller, but that’s OK. But I don’t have real kids because I tried and it didn’t happen! I have a deformity that makes getting pregnant extremely hard. I was told that I might not be able to get pregnant because of it, but I still tried. Why? Because my mom has a similar problem and I’m here! Her advice was that I should get a little “creative.” So, I did; it still didn’t work. For an individual such as myself, who all they wanted to be is a mom ever since she was a little girl, this was heart breaking. Every late period was an excitement and every negative pregnancy test tore me apart. I decided to get further checked by an OB/GYN to see if something else could be wrong, they said “no” and that based on the blood panel, I should be pregnant within six months if I kept trying. Six months later, still no pregnancy. Another problem arose, I began to feel sicker than my usual. I then proceeded to another doctor, speaking for over an hour how I’ve never felt good but it seems to be getting worse. I was concerned and so was he. Sixteen tubes of blood later, we found an answer. I had lupus. When they told me this, I had never heard of lupus or the word in my entire life. All I was told is this is what I have and there is no cure, but there are medications that can help me. As time went on, my illness escalated and the pain of wanting to be a mom grew. I saw all my friends having babies, even on their second or third. I still had no baby, just an illness. After tons of research, I saw many woman with lupus do have successful pregnancies. But, I also learned that pregnancy can flare the disease, making it become active or worsen. I’d been married for four years and everyone is asking when I am having a baby. No one was too concerned about how terrible I felt inside. Now I have many factors against me having a baby. I don’t know enough or feel nowhere close to comfortable with trying. Lately, I’ve had more bad than good days. How could I possibly, knowingly, bring a child into this world if I could barely take care of myself? To top it off, I take a medication called Methotrexate which is extremely dangerous to get pregnant on. This is not a medication to play around with as it uses the folic acid in your body to work. While folic acid is a key essential for a healthy development of a baby. So, for right now, I need to have more good days, before I take any risks. This is a decision that will not only effect my life, but the baby, and my husband. I have several factors against me. I am sorry that I am not able to meet your expectations. This is the life that was given to me and all I can do is make the best of it. If one day, I’m not on this medication, my doctor feels I’m stable enough, and I feel like trying, maybe I will. Even with all the odds against me. Please understand that at this moment, my dogs are my kids. They are my everything. They help fill a gap that is so painful in my heart. A gap that makes me cry often. Not to mention, one of my dogs has an illness to where she cannot have a collar on nor overheat. But you know everything just by looking at us, right? If I want to push them around in a stroller, I will! It’s easier for me and my health, while giving me a satisfaction that you don’t understand. But before making jokes or pass judgement, understand there might be an underlying pain you know nothing about. All you’re doing is making me much worse about something I have absolutely no control over.